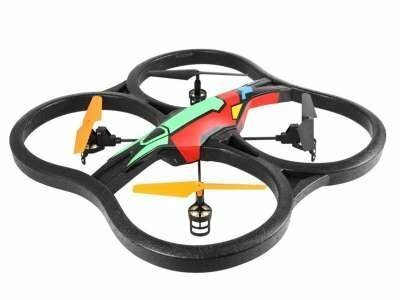 2.4 GHz UFO Intruder quadcopter - to be a pilot would be great! This unique quadcopter is fun for young and old alike! Item description: the Intruder quadcopter - the perfect stunt model for beginners. Thanks to the tough polystyrene body, the UFO is very simple to steer and is also extremely crash resistant. Performing flips, etc. can be learned quickly and safely. 4 powerful electric motors and high performance LiPo battery offer enough power in any flight attitude. Technical details: dimensions: 60 x 60 x 6 cm; 7.4 V 650 mAh battery; flight time 5 - 7 minutes; range: 100 m; charging time: 60 minutes; box contents: Intruder quadcopter, remote control, LiPo battery, charger, operating instructions (English language not guaranteed). Ideal for beginners. Quadrocopter UFO Intruder. Very strong material, 360, Evervision. 360° rotation possible.